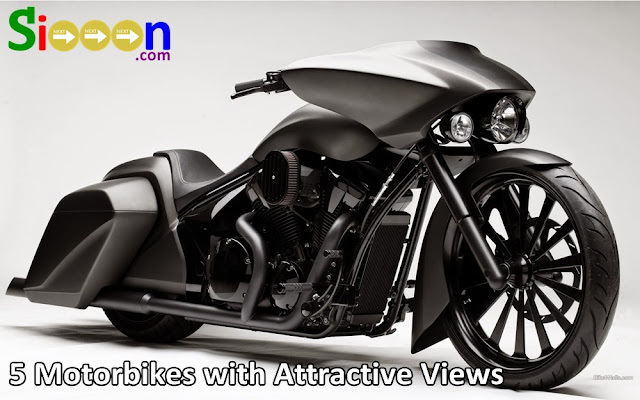 Motorbikes are one of the two-wheeled vehicles, being one of the most efficient vehicles because they can have a slimmer form besides that they can be used for traveling and don't want to get jammed. There are many types of motorbikes from Motorbike Matic to Sport and Classic Motorbikes with unique shapes. First, the Dodge Tomahawk motorbike uses a car engine from the Dodge Viper, V-10 SRT. This motor has power of up to 500 hp with acceleration from 0-60 km / h in just 2.5 seconds. This motor weighs up to 680kg, but even so, this motorbike is very fast. As for the price reaches 550,000 USD. It can be seen from the appearance of the motorbike that it has a unique shape and is different from the others, so it feels like having a Limited Edition Motorcycle. Has a speed of 1,670 CC, a very high size for the Motorcycle class. This motorbike is sold on the market and is free to use on the highway, which makes it expensive, there is gold on the body of the motorbike. Coupled with chrome accents in some parts such as handlebar, alloy wheels and engines, this motorbike looks very luxurious and dashing. No wonder the price reaches $ 3,000,000. This motorbike has a sleek, old and unique appearance but this motorbike has a price of up to 3.5 million USD. What makes it expensive is because this motorbike is an antic and rare motorbike, this motorbike was introduced in 1894 and 1897. Indeed, items from historical heritage have high selling points. If you are an antique collector, maybe this bike can decorate the garage or house. Moto bikes that have twice the price of the previous one, motorcycles made in 1949 are sold at prices reaching 7 million USD. In 1949, this motorbike was considered the most innovative design motorbike. What makes the price very expensive is because currently the E90 AIS Porcupin motorbike is only 4 in the world. Really Limited Edition and rare. And the most expensive motorcycle in the world is Neiman Marcus, with prices reaching $ 11,000,000, this motto is limited edition because there are only 45 units in the world. The price of this motorbike was initially lower at around $ 110,000 USD but because it was sold at auction and many wanted to own this motorbike, the price continued to rise to 11 million USD, for motorcycles reaching 305 km / hour. That's a Unique and Interesting Motorcycle in the World at a very expensive price, even for the price of 1 unite Motorbike above, you can buy a house, apartment, or car. But if antiques and rare things do have a very high value. Keyword : The best motorbike in the world, the most expensive motorbike in the world, the rare motorbike in the world, the unique and interesting motorbike, the unique and rare motorbike design, the best collection of motorbikes in the world, the fastest collection of motorcycles in the world, the fastest and most expensive motorcycle in this world.